Merry bloody Christmas! Count Dracula (Conor Dwane) in a scene from The Fangs of Fame, a follow-up to Christmas at Dracula’s (2017). Picture: YouTube/El Diablo Productions Cork. It has become a tradition at Vamped for me to do a blog post each holiday season to spread some vampire Christmas cheer for our readers. To be honest, this year I wasn’t feeling very inspired or in a festive mood to write this post. Maybe it is all the holiday preparations, too much work, the extra time I have been putting in at the gym or my bitterness towards Facebook. Normally each year, I find little vampire tidbits on Facebook, and being suspended for three weeks for no valid reason, has also kind of put me off social media for now. Either way, I made it this year and came up with a Christmas vampire treat bag for you all. Enjoy! Christmas cookie cheer. 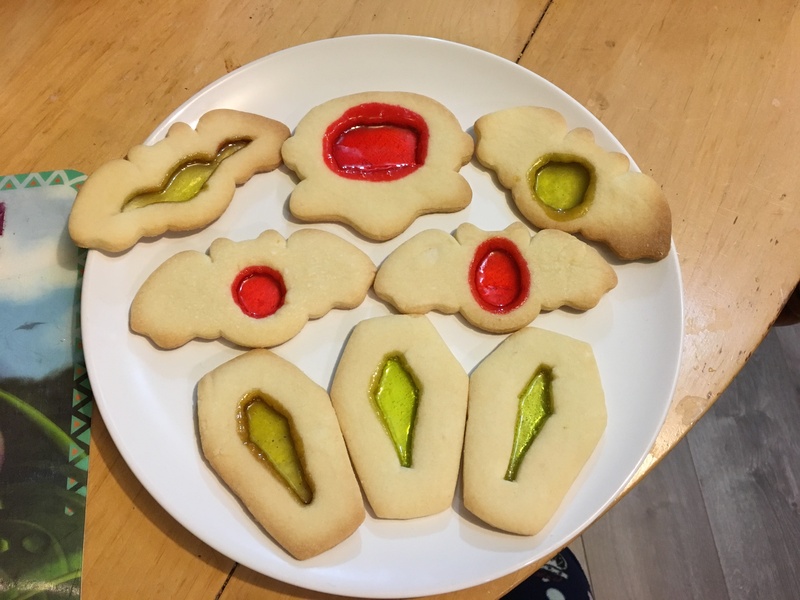 Shortbread cookies with a vampire spin, fit for Christmas. Picture: Erin Chapman. This year I was racking my brain, trying to think of something vampire-themed to bake. A couple months back I came across a random post on Facebook that showed stained glass cookies. Essentially, you cut out the middle of rolled out cookies and then place candy in the center. They melt and the effect resembles a coloured window. I applied this concept to some shortbread cookies this year. The recipe I used was quite standard as far as shortbread goes. You can find it here, but keep in mind I didn’t follow the recipe concerning the decorating part. I made the dough and wrapped it in saran wrap and chilled it in the fridge for about an hour. I rolled out the dough and used my collection of vampire cookie cutters: vampire bat, gravestone and Dracula. Once the cookies were cut out, I had to use a sharp knife to remove the middle of the cookies. I placed them on parchment paper and filled the center of the cookies with crushed red and green Jolly Ranchers. The only trick is to not overfill the center as the candy will melt. I had to toss a few that overflowed and didn’t look very pretty. My only complaint, was the green apple Jolly Ranchers weren’t as bright of a green as I would have liked. For next time I would try to track down some different candy to use. You can make them any color you want and as a bonus, if you leave a hole in the top, you can tie a ribbon to the cookies and hang them on your tree. I didn’t make them gluten free this year, and gave the cookies away to a coworker. You can find it here: Barry C. Parsons, “Old Fashioned Shortbread Cookies,” RockRecipes.com, December 11, 2014, accessed December 12, 2017, https://www.rockrecipes.com/old-fashioned-shortbread-cookies/. archive.is link: http://archive.is/ZTTWs. Told through the eyes of The Invisible Man, Count Dracula has hit rock bottom, so with the help of his noble companion Igor, he decides to throw the greatest Christmas party of all time. But when two killers arrive at the door, things slowly begin to spiral out of control. And Dracula’s faith lies in the hands of one creature…death himself! I had never heard of this film before, but it was submitted to the 7th Annual HorrorQuest Film Festival and screened on Sunday October 16, 2017 in Atlanta, GA. It looks like the festival is an annual one and free! If you live in the area, it might be something to check out. the IMDb synopsis: “Christmas at Draculas,” IMDb, 2017, accessed December 20, 2017, http://www.imdb.com/title/tt2946610/. archive.is link: http://archive.is/urOkV. 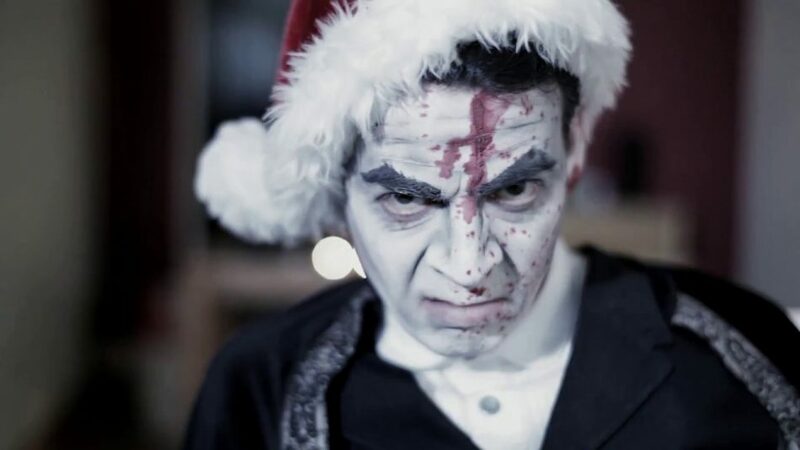 “Christmas at Dracula’s – Horror Trailer HD (2017),” YouTube video, 3:25, posted by HorrorQuest, June 29, 2017, accessed December 20?, 2017, https://www.youtube.com/watch?v=jqeTvXaidGY. Christmas tree decorations. What better way to decorate your tree than an ornament with a dark lady of the night? Picture: Houzz. Vampire trinkets for your Christmas tree are a must have for any vampire fan. Last year I did a Virgin’s View of the classic vampire film, Dracula’s Daughter (1936), and I was surprised to find this little gem. You can add this baby to your collection for only US$35.99. Another interesting Christmas treat on this website was a Dracula nutcracker. a Virgin’s View of the classic vampire film: Erin Chapman, “A Virgin’s View on Dracula’s Daughter (1936), Vamped, December 21, 2016, accessed December 15, 2017, http://vamped.org/2016/12/21/virgins-view-draculas-daughter-1936/. 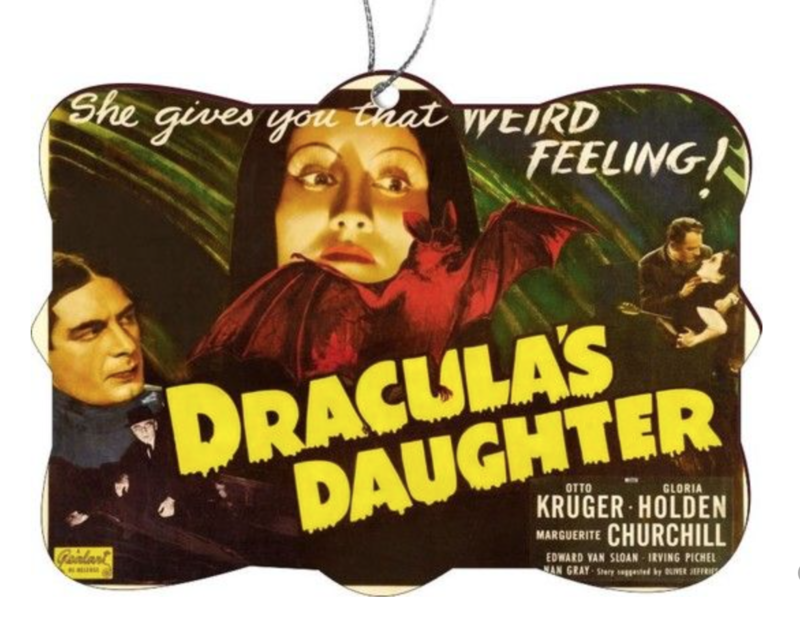 find this little gem: “Vintage Movie Posters Dracula’s Daughter Rectangle Christmas Tree Ornament,” Houzz, 2017, accessed December 20, 2017, https://www.houzz.com/product/102680809-vintage-movie-posters-draculas-daughter-rectangle-christmas-tree-ornament-midcentury-christmas-ornaments. archive.is link: http://archive.is/Lpl7h. a Dracula nutcracker: “10” Dracula NC,” Houzz, 2017, accessed December 20, 2017, https://www.houzz.com/product/91113145-10-dracula-nc-traditional-holiday-accents-and-figurines. archive.is link: http://archive.is/kP41L. When you Google “vampire+christmas” the number one result was a book called All I Want for Christmas Is a Vampire (2008). It is part five in Kerrelyn Sparks’ Love at Stake series. It also looks like the author has done more than one vampire Christmas book too. This might be something worth asking Santa to put under the tree for you. Check out the book’s trailer, above, if you’re interested. the author has done more than one vampire Christmas book: The series includes a novella called A Very Vampy Christmas, first published in the anthology Sugarplums and Scandal (2006). –Ed. “All I Want for Christmas Is a Vampire Kerrelyn Sparks …,” YouTube video, 1:12, posted by cosproductions, September 19, 2008, accessed December 20?, 2017, https://www.youtube.com/watch?v=t3AA11YUVro. A Dracula Christmas Carol: a Christmas tradition with a vampire spin. Picture: Socomic. 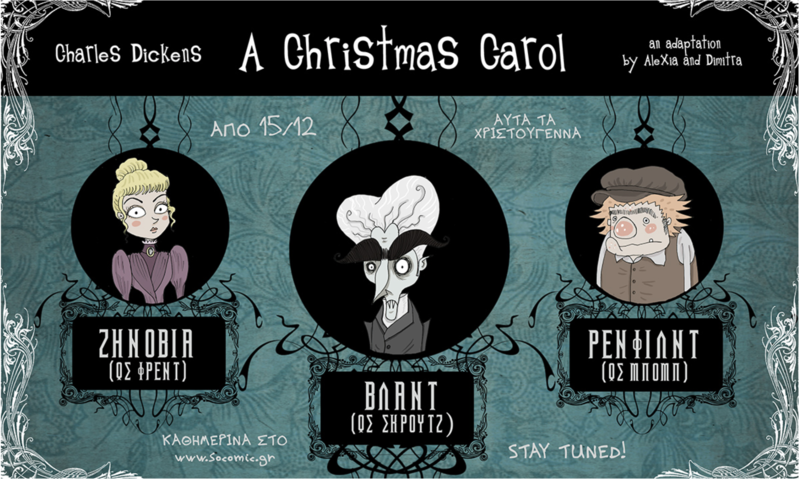 I found a version of the famous story, A Christmas Carol, on a Greek website with a Dracula spin on it. The comic is eighteen pages and was published back on December 15, 2014. I loved the how the artist portrayed the characters in the story, especially the Nosferatu look-a-like. My only complaint about the site, is it is a little challenging to navigate when you are translating the pages into English. Quirky characters. I love the eyebrows, wonky eyes and bulging forehead. Picture: Socomic. 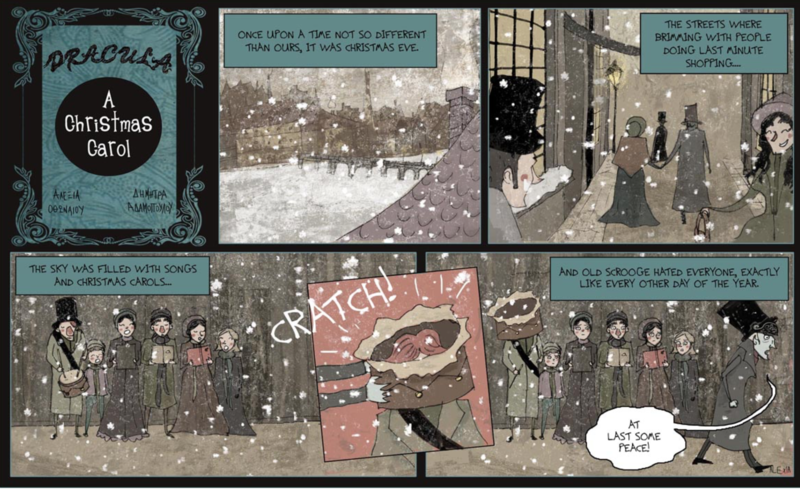 a with a Dracula spin on it: socomic, Dracula Christmas Carol, So Comic, accessed December 20, 2017, http://www.socomic.gr/en/series/dracula-christmas-carol/page/3/. That about wraps it up for me. Anthony and I would like to wish you all a Merry Christmas! Be safe and we will see you all again in 2018. We have some cool things coming up in the new year so stay tuned! Was Vlad Dracula a Vampire? The festive season assumes а special preparation and stylization of our dishes and the surrounding interior. This will create the appropriate atmosphere.